"All our hopes now lie with two little hobbits, somewhere in the wilderness." Prior to the initial release of The Lord of the Rings: The Fellowship of the Ring in December 2001, writer/director Peter Jackson could not have expected such a monumental response from critics and audiences. The studio nervously hoped to make a profit, and Tolkien fanatics wondered if the ambitious trilogy would meet their high expectations. Following a lengthy and very successful theatrical showing, the film warranted two very different DVD releases. The original version appeared in August and included promotional featurettes and trailers. It delivers for the casual fan, but pales in comparison to the gigantic four-disc set released in November. Featuring considerable extra footage and a wealth of stunning documentaries, this collection raised the DVD standard. The Lord of the Rings: The Two Towers followed an identical format and was presented with separate theatrical and extended editions. This summer, a third DVD version is available for each film as a "limited edition" release that provides both versions within a two-disc set. A massive army of evil Orcs and Uru-kai arrive at Helm's Deep with the single purpose of decimating every living being. By the decree of the traitorous wizard, Saruman (Christopher Lee), they will storm the structure and virtually eliminate the entire human kingdom of Rohan. Standing atop the walls are the honorable warrior Aragorn (Viggo Mortensen), nimble elf Legolas (Orlando Bloom), and silly dwarf Gimli (John Rhys-Davies). They will fight alongside a small group of elves and humans and will almost assuredly not survive the night. The enemy slams its weapons into the group and shouts a massive battle cry before charging. Is this the last stand for Middle-earth? The Lord of the Rings: The Two Towers begins immediately following the saddening conclusion of its predecessor. The Fellowship is broken, Boromir (Sean Bean) has been killed, and the Orcs have captured Pippin (Billy Boyd) and Merry (Dominic Monaghan). All is not lost, however. The two Hobbits' friends are vigorously pursuing them, and the essential quest continues. Frodo (Elijah Wood) and Sam (Sean Astin) inch closer to Mount Doom and hope to destroy the Ring of Power. Unfortunately, they also are being tracked by the creature Gollum, who obsessively seeks "the precious." The tale moves seamlessly between each element and pushes everything towards the final chapter. Being the second part of a trilogy, this film is very plot-heavy and lacks a bit of the wonder generated by the first entry. However, a similar drawback exists in the source novel, which must bridge the other parts and include considerable action. This movie actually removes several pivotal moments from the book and shifts them to the final chapter. Jackson and his co-writers took considerable heat from Tolkien fans for these alterations, but they help to make The Return of the King a classic. Another major change occurs with Faramir (David Wenham)�Boromir's brother�who captures Frodo and Sam. They venture to a Gondor stronghold and encounter the Black Riders, which does not occur in the novel. Luckily, this sequence does serve an impressive purpose. It enhances the personal struggle and again demonstrates the ring's power to attract even well-meaning individuals. When discussing this picture, it becomes nearly pointless to delve much into the specific plot elements. Even viewers who have not seen the film probably are familiar through countless articles, interviews, and television specials. Although slightly less emotionally involving than its predecessor, this film still provides stunning visuals and excellent acting across the board. The emphasis definitely shifts to Aragorn and the humans, which allows for less whimsical moments. However, this shift leads to the grand final battle at Helm's Deep, which represents a remarkable directorial achievement for Jackson. Mortensen admirably portrays the hero, and Wood brings heart to Frodo's struggles. The new actors also do well, especially Bernard Hill as the tormented King Theoden of Rohan. The final noteworthy element is the digitally created Gollum, who generates an emotional weight never seen in prior digital incarnations. Andy Serkis' voice works perfectly for the character and provides just the right emphasis. The Lord of the Rings: The Two Towers retains the momentum achieved by the first entry and pushes the characters towards an expectedly stunning final act. The abundance of designers, artisans, and effects artists deserve credit for the tale's enveloping atmosphere. They craft an engaging, realistic environment that avoids the Lucas-like pitfalls and keeps the story involving throughout its lengthy running time. The extended edition contains more than 40 minutes of new footage that adds considerable depth and charm to the original version. Although the original version ran for nearly three hours, it still focused considerably on the final battle and benefits from the extra material. Merry and Pippin's encounter with Treebeard and the Ents receives more screen time and includes fun elements from the original novel. We also see new interactions between the humans that enhance the weight of the concluding struggle. Along with the extra scenes, the extended version includes alternate cuts and shots that help to create an entirely different viewing experience. Image Transfer Review: The Lord of the Rings: The Two Towers features countless stunning images that have never been matched previously on the silver screen. This release provides a 2.35:1 anamorphic widescreen transfer that offers few disappointments. However, it does fall just a bit short of receiving my highest recommendation. The bright colors spring clearly from the screen, but they lack the stunning beauty inherent in the very best transfers. It's still an extremely worthy transfer, but is not a groundbreaking achievement. Audio Transfer Review: This release utilizes a powerful 5.1-channel Dolby Digital EX transfer that does should match viewers' high expectations. The rear speakers receive plenty of use throughout the film, and the audio flows effectively across the entire sound field. The final battle at Helm's Deep provides impressive complexity and really draws you into the action. I would have appreciated a DTS option, but have no complaints about Dolby Digital version. This disc also offers a solid 2.0-channel Dolby Surround track, which represents a significant dropoff but still delivers an acceptable presentation. Extras Review: The only new extra feature included with this release is a feature-length documentary created by director Costa Botes, hired specifically by Peter Jackson to film the entire production. This film runs for more than 100 minutes and offers an intimate perspective on the filming process. Completely lacking the promotional interviews, voiceover narration, and film clips that dominate most DVD extras, Botes' work simply depicts the cast and crew working on the picture. They do speak to the camera to discuss the tasks being completed, but the comments resemble low-key conversations between good friends. We follow the film's storyline and catch a glimpse of each key moment shot at all types of locations. The actual outdoor scenery is very impressive, and the blue-screen tricks employed to capture the story are also inspiring. It's no surprise that a lengthy final portion occurs during filming of the gigantic Helm's Deep battle, which required considerable time and energy to shoot. That grand achievement seems even more incredible after watching the production from such a close viewpoint. 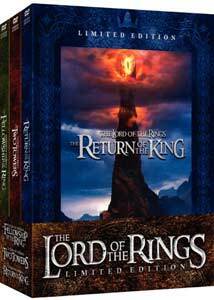 Although another DVD release of The Lord of the Ring: The Two Towers is unnecessary, completists will want to pick up this two-disc set for Costa Botes' intriguing documentary that varies considerably from previous bonus features. Casual viewers probably don't need to bother, unless they're in particular need of more detailed information on the stunning production.